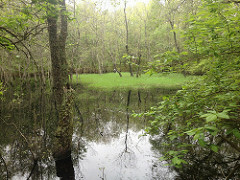 Historically, the mid-Atlantic had vast expanses of low-lying forests with extensive freshwater wetlands and streams. Much of this land has been converted to farming over the last several hundred years. Ongoing pressures include continued farming and the growth of suburban developments. 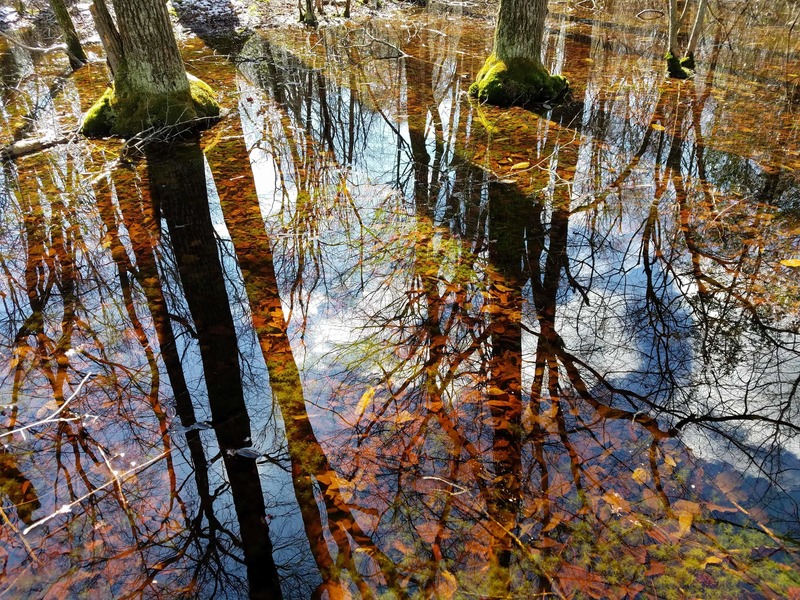 In recognition of the need for new approaches to systematically monitor and assess hydrologic conditions, wetland/stream ecosystem functions, and their impact on water quality, Palmer and colleagues have work on-going in the Eastern Shore of Maryland. 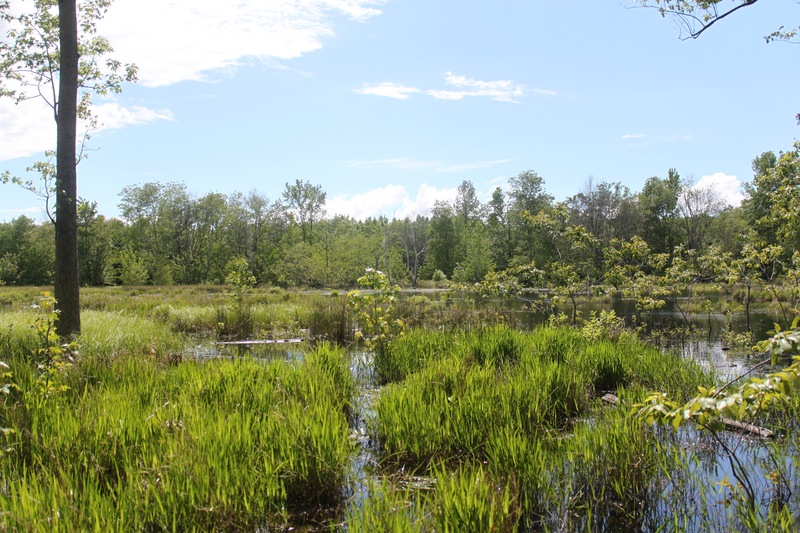 Our work focuses on GIWs on the Delmarva peninsula of the east coast U.S. where we are quantifying the patterns of connectivity of restored, natural, and agricultural wetlands to perennial stream networks. Among other differences, these three classes of wetlands vary in the duration and patterns of their connectivity as well as the amount and composition of dissolved organic matter flowing from them. This research includes using remotely sensed data, particularly radar and lidar, and extensive field sampling and experimentation, to quantify a variety of ecological functions in depressional wetlands that connect to stream networks under certain hydrologic conditions. Wetlands are among the most threatened ecosystems on earth yet they play extremely valuable roles in global elemental cycling. As transition points in the landscape between the terrestrial and aquatic realms, they are well known as sources of Carbon (C) production and biomass accumulation, as well as sinks of C received from the surrounding terrestrial environments. Despite their potential importance to understanding C fluxes they have not been adequately integrated into global scale terrestrial C budgets or into inland water C budgets. The Palmer lab has teamed with colleagues Dr. Michael Gonsior (organic chemist – aquatic systems and DOC; UMCES), Dr. Laura Lapham (biogeochemist - methane cycling; UMCES), Dr. Greg McCarty (Hydrology & remote sensing; USDA), Dr. Kate Tully (soil biogeochemist, UMD) and members of Dr. Daniel McLaughlin’s lab (hydrology, VT) to understand how wetland inundation and hydrologic connectivity influences carbon fluxes and stores. The Coastal Plain field sites are on the Eastern Shore of Maryland where members of Palmer’s lab have worked for a number of years. Restored and natural wetlands in this predominantly agricultural region appear to be isolated during much of the year but work by past graduate students Owen McDonough, Jake Hosen, and Steve Epting have documented periods of extensive connectivity between wetlands and perennial streams via intermittent channels. Current work is expanding this to quantify the dynamic nature of wetland area above and below ground and how this influences the fluxes and lability of dissolved and gaseous organic carbon. The Palmer Lab is committed to understanding the function of aquatic ecosystems and how human activity has altered those functions. Past projects include the National River Restoration Synthesis Project. For more information on that project, see the NRRSS Github page. Other past projects are below. Evaluation of infiltration-based stormwater management to restore hydrological processes in urban headwater streams. Fanelli et al Hydrological Processes (2017). Watershed Urbanization Linked to Differences in Stream Bacterial Community Composition. Hosen et al Frontiers in Microbiology (2017). Practices for facilitating interdisciplinary synthetic research: the National Socio-Environmental Synthesis Center (SESYNC). Palmer et al Current Opinion in Environmental Sustainability (2016). © Palmer lab. All rights reserved. This site is made with Jekyll and is based on the code of the Wurm Lab.